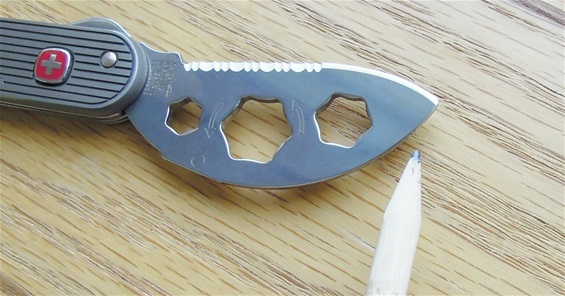 The Wenger Titanium knives can be used for rescue. Because of the special tip it can be used for cutting yourself free from rope or belts close to the body. The knives are developed specially for the use in climbing or the alpine tasks. I recommend reading trough my pages on recue blades first so it is easier to understand rescue blades. Sometimes it is possible to cut free from the outside of the rope or belt but sometimes this cannot be done. Then you will have to use the blade by sliding it under. It is a bit different with a blade that got such a large positive curve compared to a negative curve (the edge curves inwards). With this blade you would cut from the absolute beginning and not trap the rope or belt in a negative curve. Because of the tip on this blade you will not cut yourself doing this but one must always be careful. The absolute best blades for belts are the blades with a negative curve. Here is some more interesting information regarding the emergency blade that also could be called a rescue blade. There are different shapes to such a blade that I have shown here on my Rescue Blade pages. A blade with a curve inwards will have certain abilities for cutting belts. It is a performing and safe design. This shape and curve is much liked by hunters for their needs. It is more a multi function blade as well and not just a special purpose blade. It is special purpose but you get much use out of it at the same time. The Mike Horn Wenger emergency blade can be used for all of the mentioned purposes. I am a fan of the Victorinox Rescue blades but I really like the one used on the Wenger Ranger. Because the curve of the blade shape is more flat then you get a blade with some advantages for other tasks as well. This is obvious because using a blade with an inwards curve will not be possible to use towards a flat surface or materials on a board. There is a small leap inwards because of the round tip but it is for sure a more flat construction. This you can take advantage of towards a stationary material for example. The thickness is approximately 2,4mm on the back of the blade with a slim tip, it is a sturdy blade. It seems the length of the serrated part of the blade got some variations but this I am not sure. It is only serrations on this edge and no plain edge. The inner part is the same you would find on the traditional blade by Wenger. It serves some purposes and one is a stop area. Here you can see the backside of the Wenger emergency blade. There are different names for such an edge. It is no point of getting alarmed and afraid of a serrated edge. It takes very little practice to learn to sharpen them. The backside of the blade shown on the picture are not the main sharpening side but only used to remove the burr from afterwards. There are plenty of videos on youtube about how to sharpen wavy or serrated edges. It is absolutely no problem today to get a diamond rod for this task. I recommend getting a diamond rod with a fine surface. It is not needed with much pressure. I have made some information and pages on how to sharpen on sakhome.com and I recommend the sharpening page. It is very important that a Rescue blade is sharp all the time and a dull edge could be dangerous.